Parathyroid hormone (PTH) is initially synthesized as a 115 amino acid precursor polypeptide that is called preproPTH, by the parathyroid chief cells. It is then cleaved to proPTH (90 amino acids) and finally to intact PTH molecule (84 amino acids). Intact PTH is the principal form of PTH secreted into the bloodstream in response to decreased serum calcium levels. In the peripheral tissues, intact PTH is catabolized to C-terminal (carboxy), N-terminal (amino), and mid-molecule fragments. Only intact PTH and the N-terminal fragment are metabolically active. PTH secretion exhibits a prominent circadian rhythm with peak concentration occurring between 0200 and 0400 h. This peak level corresponds to the nadir in ionized calcium concentration. All forms of PTH are filtered by the kidney and metabolized by other organs. The normal half-life of intact PTH is 5 minutes, C-terminal fragment 30-40 minutes, and N-terminal fragment 5 minutes. In renal failure the half-lives may extend to as much as 30 minutes for the intact molecule, 24-36 hours for the C-terminal fragment, and 30 minutes for the N-terminal fragment. With normal renal function the concentration of metabolically inactive C-terminal fragment is approximately 10 times higher than intact molecule. The N-terminal fragment concentration is < 10% of that of the intact molecule. Prolongation of the half-life of the C-terminal fragment in renal failure means that it may account for as much as 10,000 times as much serum hormone as the intact PTH. For this reason, it is very important that the PTH assay measures only intact PTH and does not crossreact with the metabolically inactive C-terminal fragment. Calcium homeostasis is maintained by the concerted actions of PTH, Vitamin D, and calcitonin. The stimulus for PTH secretion by the parathyroid gland is low circulating levels of plasma ionized calcium. Normal calcium levels are restored when PTH causes reabsorption of calcium from bone, reabsorption of calcium by the renal tubules, and increased synthesis of 1,25 hydroxyvitamin D3. The latter increases intestinal calcium absorption. The C-cells of the thyroid gland produce calcitonin, which decreases serum calcium largely by stimulating the incorporation of calcium into bone. Calcitonin is secreted at a rate directly proportional to plasma ionized calcium. 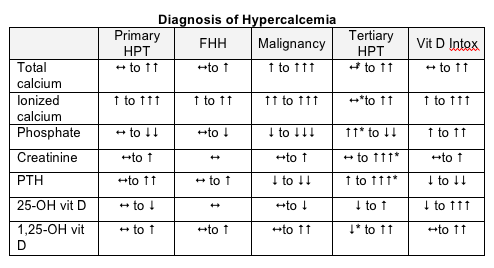 The differential diagnosis of hypercalcemia depends on the clinical setting. Overall, primary hyperparathyroidism and malignancy account for 80 – 90% of hypercalcemia cases. However, primary hyperparathyroidism is the cause of ~60% of ambulatory cases and of ~25% of inpatient cases, whereas malignancy causes ~35% of ambulatory cases and 65% of inpatient cases. Hyperparathyroidism is due to overactivity of one or more of the parathyroid glands, which leads to overproduction of PTH. Hypersecretion of PTH can be due to primary, secondary or tertiary causes. Primary hyperparathyroidism is associated with hypercalcemia, whereas secondary and tertiary hyperparathyroidism are associated with hypocalcemia. Primary hyperparathyroidism has an overall incidence of 1 in 1,000 and is the most common cause of hypercalcemia in outpatients. It occurs approximately three times as often in women as in men and occurs with increasing frequency after the age of 40. In primary hyperparathyroidism the gland is overactive, producing an excessive amount of PTH that leads to hypercalcemia. The consequences of hypercalcemia range from dehydration, extreme thirst, lethargy, muscular weakness, and renal damage with polyuria to production of renal calculi. In approximately 85% of cases, primary hyperparathyroidism is caused by a solitary, benign parathyroid adenoma. The remaining cases are caused by diffuse hyperplasia of all of the parathyroid glands (12%) or by multiple adenomas (3%). Serum total calcium levels are usually less than 13.0 mg/dL and the patients are asymptomatic when hypercalcemia is initially discovered. Most patients with hyperparathyroidism have borderline increased or high normal concentrations of intact PTH. Even high normal PTH values should be considered abnormal because patients with increased calcium values should normally have suppressed PTH concentrations.However, high normal PTH and hypercalcemia may be present in patients with familial hypocalciuric hypercalcemia. A low 24-hour urinary calcium concentration (<100 mg/24 hours) suggests this disorder, but a normal concentration does not rule it out. Malignancy is the most common cause of hypercalcemia in hospitalized patients. The hypercalcemia of malignancy is largely due to the production of parathyroid hormone related protein (PTHrP) by the tumor that interacts with PTH receptors, leading to hypercalcemia. Serum total calcium levels are usually between 11.0 - 15.0 mg/dL and are associated with low to undetectable PTH levels. Several clinical syndromes may be associated with hypocalcemia including hypoparathyroidism, hypomagnesimia, PTH resistance, renal failure with secondary hyperparathyroidism, and vitamin D deficiency with secondary hyperparathyroidism. Commonly used drugs may affect serum PTH level. Diltiazem, a calcium channel antagonist, acts as an agonist in the parathyroid cells and inhibits PTH release by increasing cytosolic calcium. Furosemide produces a mild increase in serum PTH. Approximately 10% of patients taking lithium develop increased PTH and hypercalcemia. Current immunoassays measure intact PTH, by using two antibodies in sequence, the first recognizing the N-terminal and the second the C- terminal. Reference range using an automated chemiluminescent analyzer is 10 – 69 pg/mL. Specimen requirement is one SST tube of blood. The tube should be centrifuged within one hour after drawing and the serum frozen.